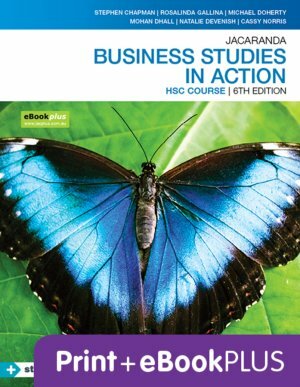 This combined print and digital title provides rigorous adherence to the Business Studies Stage 6 Syllabus, including greater emphasis on learn tos as well as learn abouts. This series is the trusted market leader, updated with new content and real-world case studies to engage students of all abilities and help them achieve exam success. • Topical case studies that reflect real world business practice, including examples from Uber, the ‘gig economy’, 3D printing, Nurofen, death of the iPod and social influencers. • A new year-long case study which focuses on the equipment and apparel retailer Kathmandu. • Many new interesting business examples from a range of companies such as Aldi, Apple, Nike, MesCheveaux, Pack & Send, Ikea, Oscar NATURAL and Cow leaseback in China. Jacaranda’s unique exam preparation tool studyON is now included free, maximising every student’s opportunity for exam success.